My son and I made this darling Leprechaun Craft today and I am in love with how his turned out. He was pretty smitten by him too and told me his name was “Shammy.” Too cute, right?! If you are looking for a simple craft to celebrate St. Patrick’s Day, look no further. 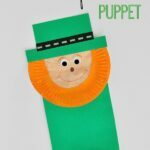 This leprechaun craft is super simple to make and kids of all ages will enjoy it. 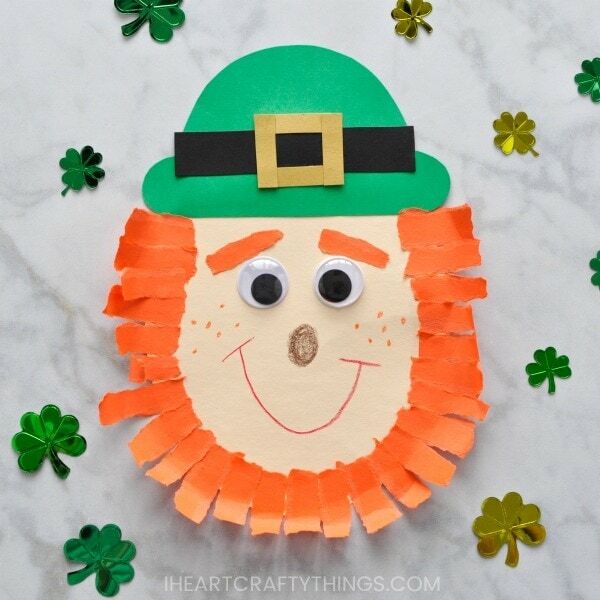 The torn paper construction paper beard adds some extra fun, festive flair and dimension to this cute kids Leprechaun craft too. 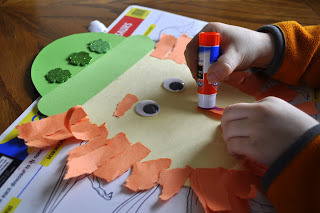 This Leprechaun craft and post has been edited since it was originally posted. You will find pictures of our original craft and the updated version here. This post contains affiliate links to the products mentioned. 1. Below you can see how I prepped my paper pieces to start making the leprechaun craft. I cut an oval face shape out of a manila folder so we wouldn’t have to color or paint it. 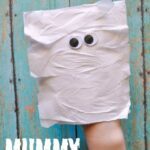 You can also use white paper and color it with a flesh colored crayon of your choice if you don’t have a manila folder. See how I cut out my pieces for the face and leprechaun hat pictured below. The orange construction paper will be used for the beard. NOTE: You can now get a pattern in my store to make prep time for this St Paddy craft a breeze! 2. To start, glue the two hat pieces together and then glue it on your Leprechaun’s face. I had some shamrock glitter stickers so my son added those to the hat. Instead of shamrock stickers you can also cut out a black hat belt and gold buckle from construction paper and add it to your leprechaun hat. 3. 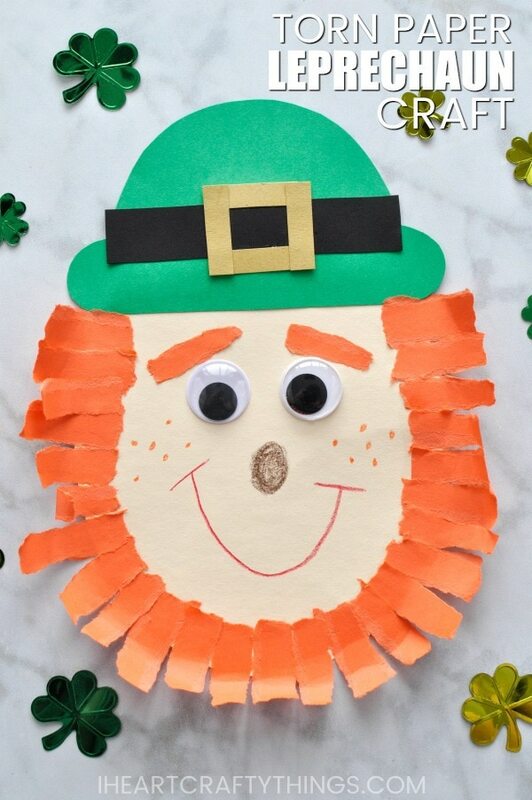 Then tear off small rectangle pieces of orange construction paper and glue them around the face to make the leprechaun beard. My son also tore a couple small pieces to use as eyebrows. When you are finished with the beard, glue on the eyebrows and two large googly eyes. 4. 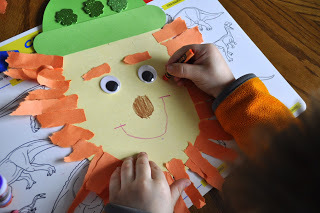 To finish your leprechaun craft, use crayons to finish making the leprechaun’s face details by drawing on a nose and mouth. My son added freckles which I think made his leprechaun extra cute. Your Leprechaun Craft is complete! My favorite thing about this leprechaun paper craft is how different each child’s leprechaun turns out. Each child can give their leprechaun a unique personality based on how their beard, eyebrows and smile look. 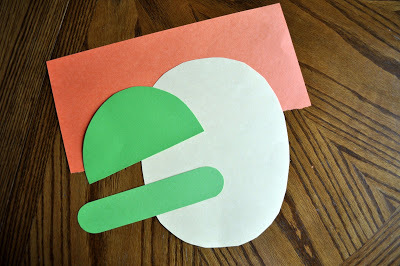 This makes it a great preschool craft to make at school to display on a classroom bulletin board for St. Patrick’s Day. 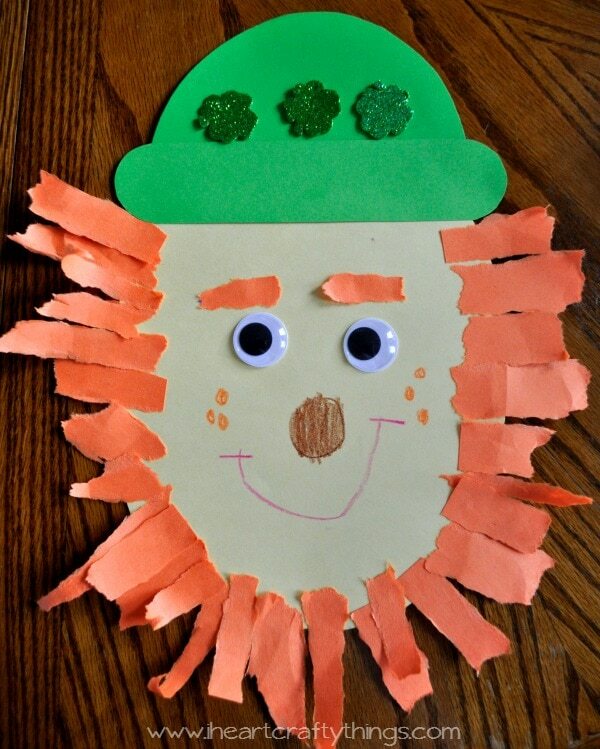 Watch the video below to be guided through each step of our leprechaun craft. 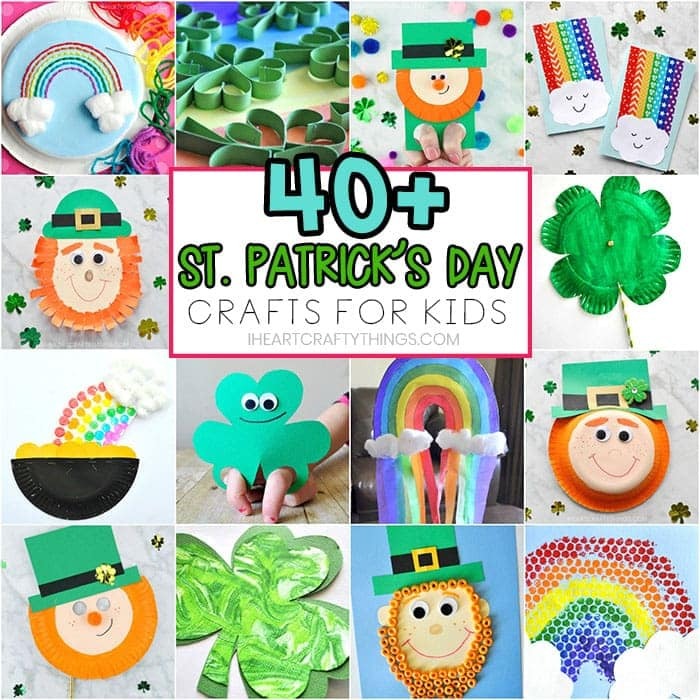 Looking for more St. Patrick’s Day crafts for kids? 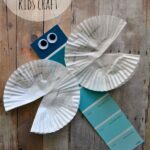 Check out this amazing list of over 40+ St. Patrick’s Day crafts for kids using materials like paper plates and toilet paper rolls. I love this! He's so, so cute!! Great craft, I have made up the pieces to do with my son and daughter tomorrow to bring to our St. Patty's Day feast! Ooh, I love the torn paper beard! Wish I had thought of that. Shammy looks like Uncle Sol!!! Cute idea! It turned out great! So cute, Rachel! I pinned it to try it next year. Thank you for sharing at Sharing Saturday! I hope you will share with us again this week! I adore him! So cute 🙂 Thanks for allowing me to share in my St. Patrick's Day roundup!